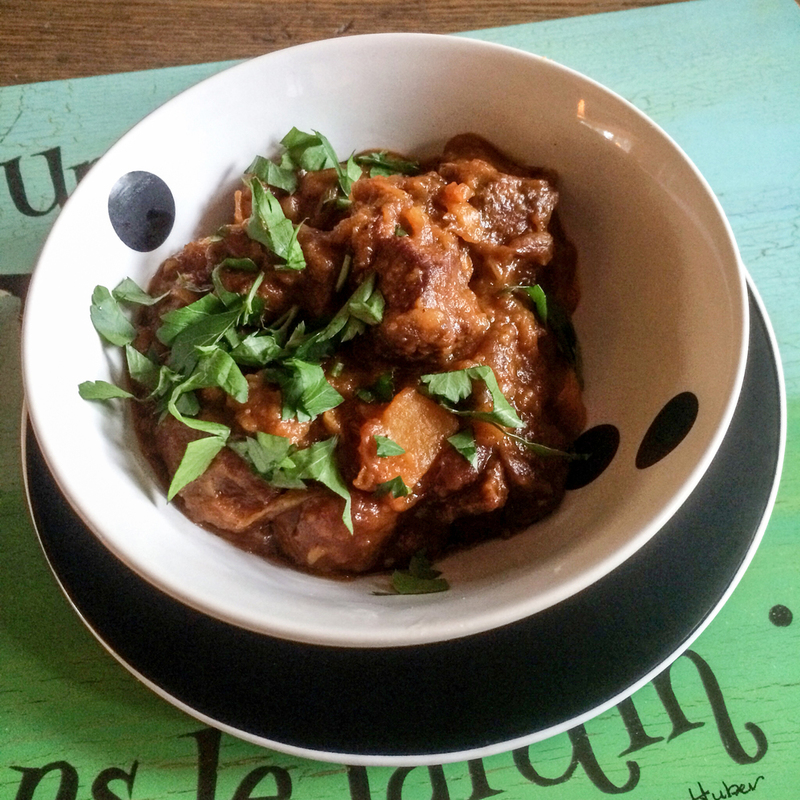 Moroccan Lamb with Sweet Potato and Raisins — Good Food Makes Me Happy! An easy, flavorful recipe – note that it takes about 2 hours to simmer gently at the end. This is a great make-ahead dish as it's even better the next day. Serve on its own or with a simple green salad. Heat a large dutch oven over high heat. Add a little oil and brown the lamb pieces in batches for at least 5 minutes until browned all over. Remove and set aside. Add a little fresh oil to the pan if needed. Add the onions and a good pinch of salt and pepper. Fry for 4-5 minutes until lightly colored, then add the garlic, ground ginger, saffron, ground coriander, cumin seeds, paprika, fennel seeds, cinnamon stick and bay leaf. Stir for 2 minutes until aromatic. Add the tomato paste and stir for 30 seconds, then add the sweet potato, coating well with the mixture in the pan. Return the lamb, plus any resting juices, to the pan along with the raisins and stock. Bring the stock to a boil, scraping up any bits stuck to the bottom of the pan. Lower the heat and simmer gently, uncovered, for 2 hours, stirring occasionally, until the lamb is really tender. If the liquid is reducing too much, cover the pan or add a cupful of water. Serve garnished with chopped parsley.